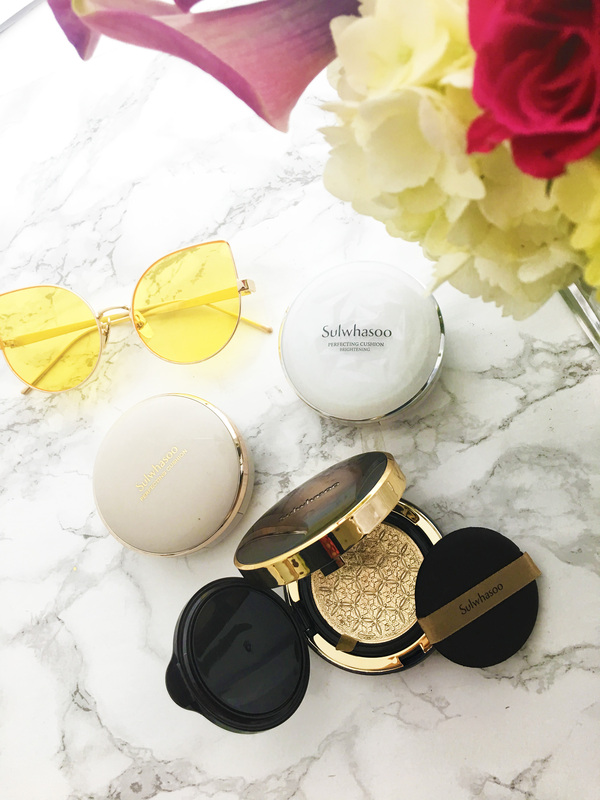 When I heard that Sulwhasoo was releasing a new version of its cult favorite Perfecting Cushion Compact, I was super excited. After all, the original Perfecting Cushion has been my HG for ages — it’s still one of my favorites and something I can’t live without when I travel, great for coverage and UV protection in one and even better for touching up throughout the day. The second iteration of the original, the Brightening version, is one that I’ve grown to love. It’s perfect for my wintertime skin, which gets a touch paler than in the summertime. And it’s less dewy than the original so it’s better for my oily T-zone. 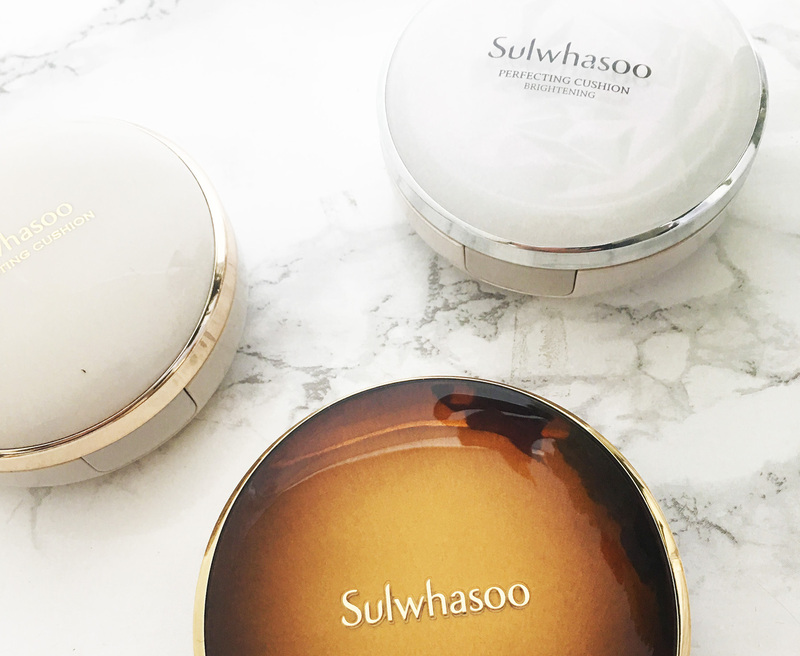 So how does the new Sulwhasoo Perfecting Cushion Intense SPF 50/PA+++ compare with these two HG cushion compacts? At first, not very well. But it’s growing on me. Here’s why. Claim: It’s touted as an anti-aging cushion with skin firming benefits. Key ingredients include red pine extracts, plum blossom, and a Radiance Pearl Powder Complex . Ingredients: Yay! Finally no alcohol in the formula (unlike the Original and Brightening). Water, Cyclopentasiloxane, Zinc Oxide (Ci 77947), Titanium Dioxide (Ci 77891), Glycerin, Phenyl Trimethicone, Ethylhexyl Methoxycinnamate, Butylene Glycol Dicaprylate/Dicaprate, Peg-10 Dimethicone, Cyclohexasiloxane, Methyl Methacrylate Crosspolymer, Niacinamide, Trehalose, Lauryl Peg-9 Polydimethylsiloxyethyl Dimethicone, Ricinus Communis (Castor) Seed Oil, Butylene Glycol, Acrylates/Ethylhexyl Acrylate/Dimethicone Methacrylate Copolymer, Propanediol, Glycyrrhiza Uralensis (Licorice) Root Extract, Trimethylsiloxysilicate, Aluminum Hydroxide, Lilium Candidum Bulb Extract, Paeonia Albiflora Root Extract, Rehmannia Glutinosa Root Extract, Nelumbo Nucifera Flower Extract, Polygonatum Officinale Rhizome/Root Extract, Sodium Chloride, Stearic Acid, Triethoxycaprylylsilane, Disteardimonium Hectorite, Hydrogenated Castor Oil, Polysorbate 80, Honey, Hydrogenated Lecithin, Beeswax, Ethylhexylglycerin, Adenosine, Methoxy Peg-114/Polyepsilon Caprolactone, Copernicia Cerifera (Carnauba) Wax, Pinus Sylvestris Leaf Extract, Prunus Mume Flower Extract, Mica (Ci 77019), Tin Oxide, Phenoxyethanol, Iron Oxides (Ci 77492), Iron Oxides (Ci 77491), Iron Oxides (Ci 77499), Fragrance. Shades: Seven shades from 11 to 33 (don’t be fooled by the names of the shades; I’m a 23-25, which is good for light-medium skin tones). Even though I prefer 25 in the summertime, the 23 is acceptable for my wintertime skin. Packaging: A deep chocolatey color with gold trimming. And the gold embossed foil to protect the cushion when you first open the cushion is a nice touch. Sooo gorgeous. Puff applicator: But then … there’s that puff applicator. The puff applicator feels oddly stiff as I apply the cushion on my face, which doesn’t help application. It almost has a paper sort of sound and feel, not like your typical cushiony ruby cell puff. It does the job, though, and maybe it doesn’t absorb as much product, but I have to say, for such a high-end brand and a great formula, their puff applicators have been surprisingly disappointing. I’ve even opened a brand new original Perfecting Cushion once where the puff just disintegrated as soon as I started using it. It started to crack and peel and patches would fall off with every dab. I had to switch it out with a Memebox I’m Rubycell puff applicator, which was way, way better: It picked up product better, felt cool to the touch, and cleans really well. Formula: At first, the formula seemed quite sheer. Even after multiple passes, it didn’t cover my spots like the Original or the Brightening. And it didn’t sink in very well, leaving little opaque spots in my pores (though I tend to attribute this to the puff applicator, since its stiffness doesn’t allow me to get into the nooks and crannies around my nose as well — on my cheeks, the finish looked smooth and didn’t get into my fine lines). The finish is not super dewy like the Original, maybe even less dewier than the Brightening, which is good — it just gives me a nice glow. And after a few uses (maybe after breaking in the puff a bit), I find that the formula sinks in better, with less “spotting” in my pores, and a more medium level of coverage. You know, I think I can get used to this. What I like: Gorgeous packaging, smooth coverage that doesn’t get into creases throughout the day, and no alcohol in the formulation, unlike the original two versions. What I don’t like: The puff applicator, and I wish there was more coverage. Claim: Magnolia extract reduces the appearance of discoloration and promotes more even-looking skin, while a Pearlescent Complex with extra-fine pearl powders gives skin an immediately luminous look. Ingredients: According to the cosdna analysis, the first ingredient is Glycyrrhiza Uralensis Root Extract, or licorice root, which is good at lightening skin tone. (I love it when a plant extract, and not water, is the first ingredient.) The downside is there’s alcohol in this formulation. It’s really frustrating because so many “brightening” or lightening products seem to contain alcohol, and I just prefer not to have alcohol in my skincare. Yes, it’s about halfway down the ingredient list, so it’s not a deal breaker, and it certainly hasn’t stopped me from loving this cushion. Also, the magnolia flower extract touted in the marketing claims? Third to last in an ingredient list of almost 60 ingredients. But then again, I don’t really expect a makeup product or even a face cream to really make a difference in my skin. For that, I rely on my serums, so it’s not that big a deal to me. Shades: Seven shades from 11 to 33 (though the brightening feature of this cushion makes it a touch lighter than the same shade in the Original). Packaging: A bright white compact with an almost “glass nail” effect, trimmed in silver. Puff applicator: I haven’t had a problem with this puff applicator. It feels pretty typical and it does the job decently. Formula: This definitely imparts a more “halo” effect, if you will. It looks brighter on my skin than the Original 25 (almost to the point of looking more like a #23), so it’s all I use in the wintertime. It’s brighter and lighter in tone that even the Intense #23, so definitely expect a visual brightening on your skin with this shade. What I love about this is that it’s more matte than the Original, which makes it perfect for my oily T-zone. It also offers solid coverage — not quite full but a tad more than medium. On busy days, it covers my dark spots just enough so that it’s all I need. What I like: The semi-matte finish, the decent coverage. What I don’t like: Alcohol in the formula, and it’d be a tad light for my skin tone in the summertime. Claim: The prestige brand’s first cushion with apricot kernel oil works to promote collagen production, botanical extracts for antioxidant protection, and Jaumdan water to hydrate. Ingredients: I don’t know why companies tout an ingredient that’s practically last on the ingredient list when they have other great ingredients higher up in the list. Sigh — such is marketing. 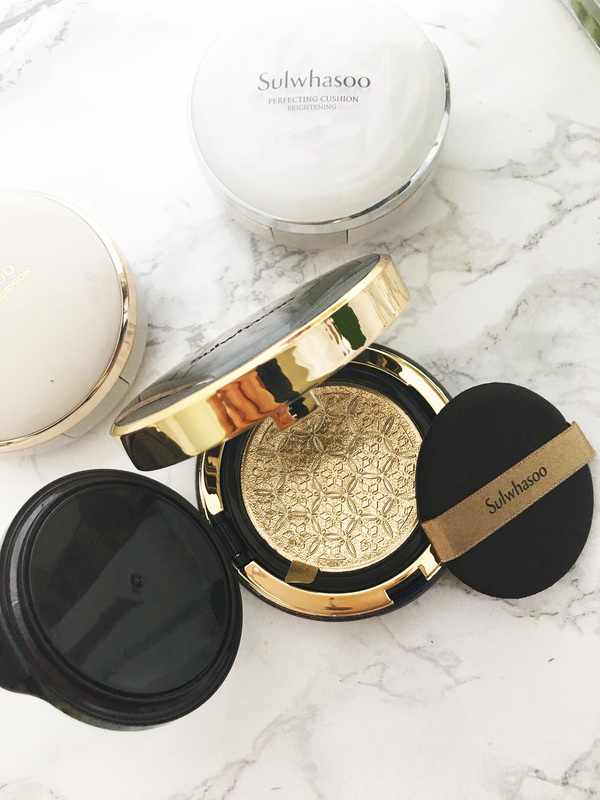 Packaging: A chic, domed compact in a creamy ivory shade with gold trim. My HG for so long. Puff applicator: Like I mentioned above, the puff applicator has been all over the place with this cushion. The first couple have been fine, and then I got one that started disintegrating as soon as I started dabbing. I don’t know if I got an old or defective one, but I’ve never seen that before with any other cushion. It’s really surprising for a prestige brand. Formula: Original 25 is more a match for my skin tone in the summer, when I want a warmer look, so I’ve been using the Brightening version these days. I like to occasionally use this along my jawline for a very subtle contour. For me, this covers my dark spots pretty well — it may be because it’s a bit darker than the other two cushions. This also has a super dewy finish, so I definitely need powder on the T-zone, but it does a nice job of reflecting light on my cheekbones (which may be another reason why I feel that it covers my dark spots better). What I like: Good coverage, a must for traveling. What I don’t like: Alcohol in the formula, though it’s almost 2/3 of the way down, so it’s not a deal breaker. Have you tried any of Sulwhasoo’s cushions? I’d love to know how your experience compared to mine. Thank you for your in depth review ! I’m thinking of buying the original cushion I notice they have more shades than before? I’m an NC 25-30 leaning 30 over the summer with yellow undertone. Do u think 25 pink or 25 sand or 27 will match? Hi Rilarila, the 25 is a tad tan for me in the winter, but great in the summer. So for summer, I think 25 sand or 27 would be good. 25 pink is too pink for me, and I tend to have a neutral undertone. Thank you for the thorough review. I was about to get it but changed my mind after reading your review. The appearance is awesome though. Ah, I think I just got a lemon! Thanks for letting me know! That makes me feel better about the cushion.